Montblanc will launch Emblem and Emblem Intense, two new fragrances for men, this spring. Other recent fragrances from the brand include Legend Special Edition 2014. Emblem (above left) ~ with clary sage, cardamom, grapefruit, frozen violet leaves, cinnamon, intense woods and tonka bean. Emblem Intense (above right) ~ the stronger version, with coriander, clary sage, cardamom, frozen violet leaf, nutmeg, cinnamon, pomarose, precious woods, patchouli, tonka bean and suede. 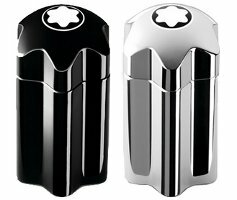 Montblanc Emblem and Emblem Intense will be available in 40, 60 and 100 ml Eau de Toilette. “Frozen violet leaf?” Maybe this means a cool sort of violet scent? Maybe! I like the bottles, although displayed together like that they look like salt & pepper shakers. I thought of cookie cutters or churro ‘cutters’. To me, violet is already a “cooling flower” ingredient to add to a scent to cool it down for the warmer months and for a floral facet; how much “cooler” can it get? However, I do have to say, violet in any male fragrance seems to make it a little classier and elegant. I tend to like the colognes with violet in them.